The fact that the feeding of the five thousand is the only miracle recorded in all four gospels, and that Matthew and Mark each tell it twice lets us know that this is important to our salvation story. It was also popular in the early church because of its hint to the Eucharist. Remember this was a big crowd. The text speaks of 5000 men. The text omits the children running around, the wives and daughters along for the day. This count includes just the men. That is a whole lot of people to feed. It is going to take a lot of bread to feed this crowd. The estimated cost was roughly equal to six month’s wages. Jesus knows what he is going to do, yet he tests Philip when he asks him where they are going to buy bread. Jesus wants to know if Phillip realizes this is not about feeding bread, but about the identity of Christ. Philip does not. This disciple of Jesus sees this is a practical question, he forgets who Jesus is. He focuses on the worldly, the practical, rather than the mystery of the holy one. Phillip even questions where they will get enough money to buy the bread. Then Andrew shares that there is a boy, a boy who came prepared for a long day. He has with him five loaves and two fish. Andrew states the obvious by pointing out those five loaves and two fish won’t go very far in this crowd. Jesus doesn’t worry about that, he tells the crowd to sit and prepare for a meal. 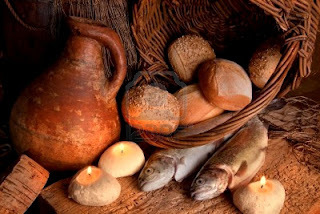 Jesus gives thanks over the meager amount of bread and fish. He then begins to hand it out to the crowd. Once all are fed, guess what? There is a bunch left over. So what does the crowd do? Give thanks? No. Show amazement? No. They want to make Jesus king. I mean just look at how he feeds them! What a glorious king he will be! Jesus doesn’t trust the crowd and so he withdraws to the mountain. Next the disciples are in a boat headed for Capernaum. Jesus is not with them. A big storm comes up and the waves get rough. They look up and there is Jesus walking on the water. They are terrified, yet Jesus tells them to not be afraid. Then he gets into the boat and they immediately reach the shore. This story is what scholars call a “theophany,” a revelation of the divine in Jesus. It speaks to us of Jesus sharing in God’s work and identity. It too is a miracle. In the midst of the storm, Jesus brings the disciples to safety. There are those who can explain to the most minute details how these miracles occurred. Like how the winds come down over the mountains in such a way that sudden storms rise up out of nowhere. There are even some “scholars” who will tell you that the feeding of the five thousand was no miracle, but rather people sharing what they had hidden from others because they felt guilty after hearing Jesus teach. I am not sure about you, but I don’t buy that. I don’t buy it because I really do believe in miracles. I believe both these instances were miracles. I believe they are part of our story because we need to remember miracles happen and I believe we are to look for miracles today. I am saddened that we, like some scholars, try to take the holy mystery out of the Trinity so that it becomes tame, safe, and distant. WHEN DO WE QUIT BELIEVING IN MIRACLES???? At what point do we begin to forget that Jesus is all about the miracles? Then and now. These stories and so much of our daily lives are miracles, yet we continue to break them down, understand, analyze, and explain them away instead of accepting them as the miracle they are. Miracles of God. I cannot explain a miracle. I can however recognize one. Not only do we quit expecting miracles, give up on answered prayers, we forget how to be child like. .
What would it take for us to see every day miracles again and remember that God answers our prayers and is a miracle maker? We aren’t supposed to worry what others think or how we look. We are to run as fast as we can to the feet of Jesus. Yet we become afraid to. It becomes easier to analyze and try to rationally understand the movement of God. And then one day we look and we find we have put God in a box. That way we can control God. To somehow tame God. We want to do all the right things, say all the right words, have all the answers. We want to be so together. And so we forget. That is safer somehow. We forget about miracles. We forget about answered prayers. We forget about wonder. We forget who we are. We forget who’s we are. We forget who loves us. We try so hard to fit God into a box we can understand that we become lost. And along the way, we forget there is nothing we can do that will separate us from the love of God. My brothers and sisters, this life of faith is not easy. It is and should be full of doubts and questions and unknowing. And you know what? I think God really likes it that way. He doesn’t want us to put him in a box and save him for a rainy day. I think what he wants most of all is to find him in new ways and new places every day. That in itself is a miracle, God WANTS a relationship with us all the time. Not just when times are good and we think we have it all together. God wants us all the time. God wants us especially in the brokenness, the mess, the stuff of life. God doesn’t need us to have it all together to feed us. The miracle is that God is there with us in that mess and wants to carry us as we walk through it. To fee us with his love. Is that not a miracle? Preston Gilham says, God, through his determination to share his heart with me, was willing to go to my ungracious place to be with me. He would rather die than live without me, even if it means ungracious places. God would rather die than live without us. God would rather feed us than let us go hungry. That is a miracle. I don’t know about you, but that is enough for me.